How does this compare to conductive thread? 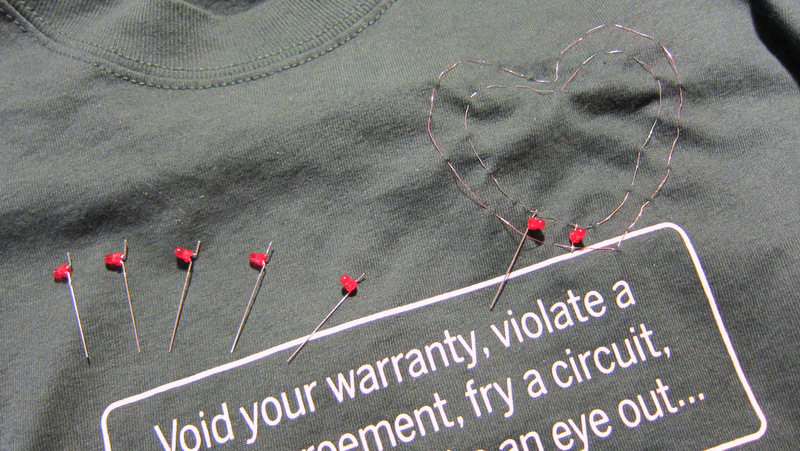 No needle required, because the wire is stiff enough to go through fabric by itself. Available in many stores and relatively cheap. May break if stretched too much, again because the wire is stiff. 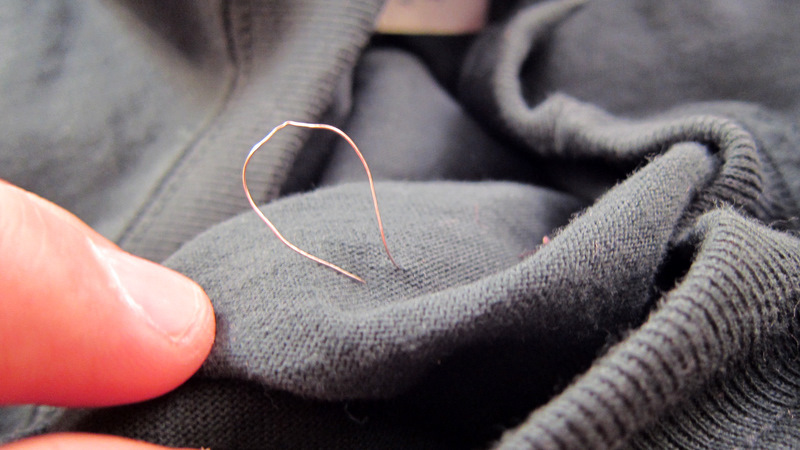 Can form small curls during sewing if not careful. First, get some 30AWG wire wrap wires,. 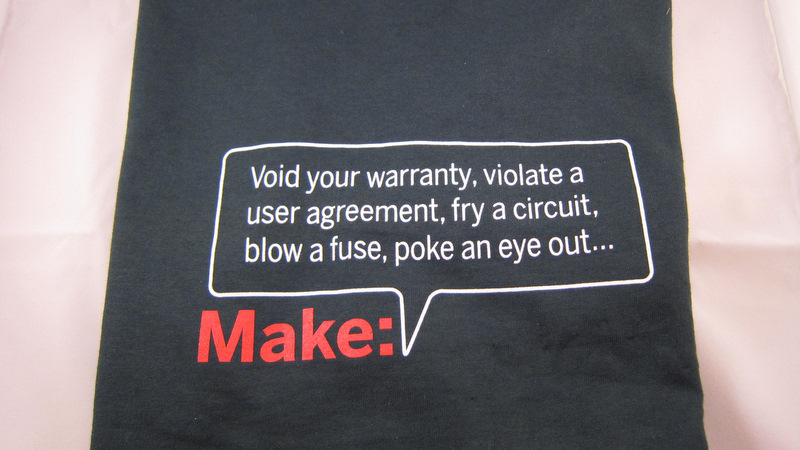 These can be found in many stores (Sparkfun, Digikey, RadioShack etc). Use a wire stripper to strip the plastic exterior. 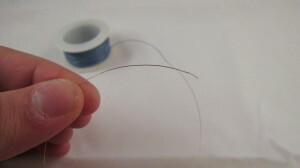 You can also get 28AWG stringing wires (used for beading) available from craft stores. These wires are un-insulated, so you don’t even need to strip them. 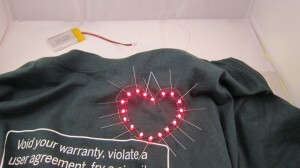 Next, pick the fabric or textile you want to sew LEDs onto. 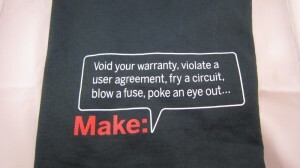 I happen to have this awesome Make T-shirt. So let me use that! Sketch your design with a chalk. I am going to have a string of LEDs connected in parallel along a heart shape. Here is my sketch. Not too bad. Cut a piece of stripped wire, about 20 inch long. 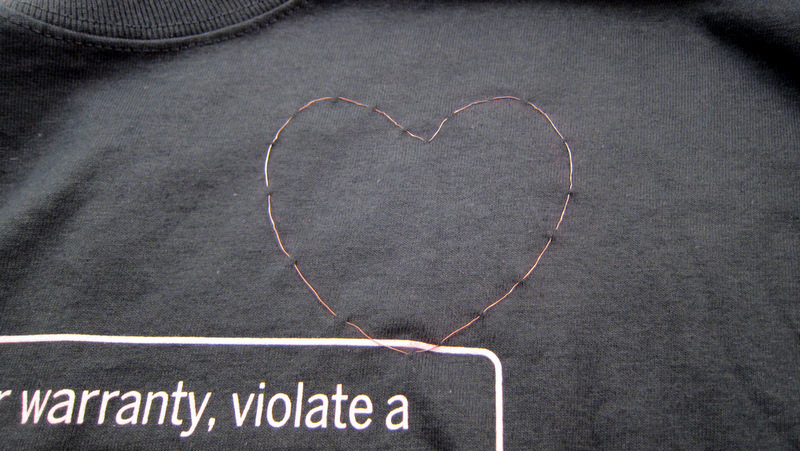 At one end, make a small knot and tighten it. 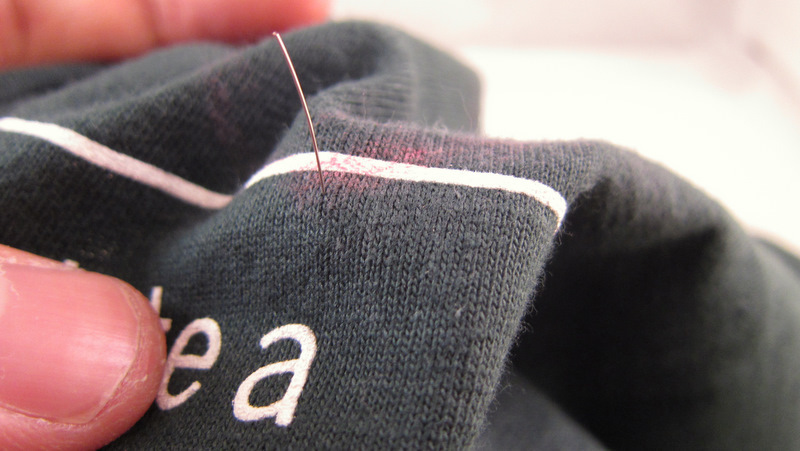 Hold the other end using your thumb and index finger, and push it through the fabric, just like how you would use a needle. Since the wire is quite stiff, it can penetrate fabric quite easily. 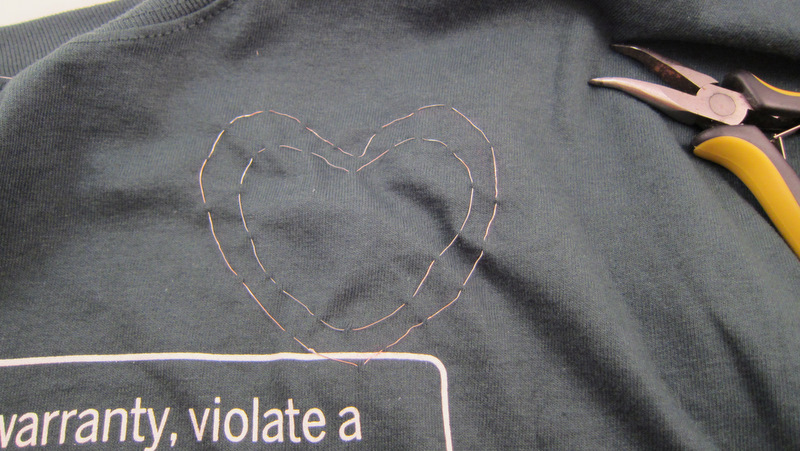 Follow your sketched pattern and move the wire forward, just like how you sew normally. 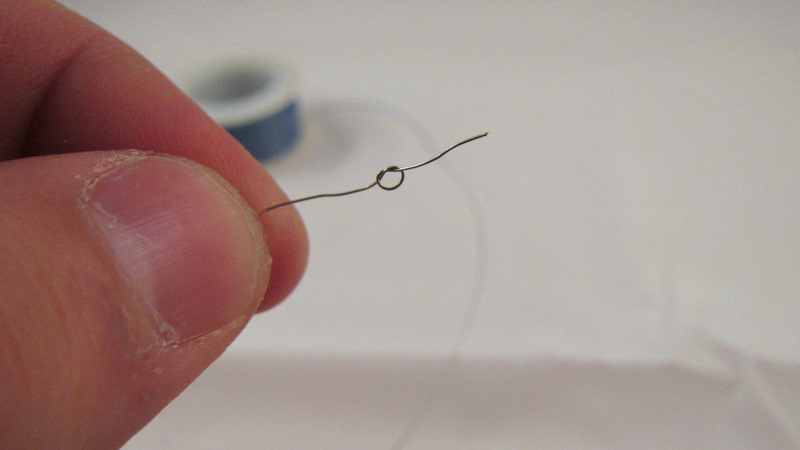 When pulling the wire out, be careful not to form small curls. Use your finger to keep the wire as smooth as possible. Watch the video above for demonstration. This is the outer layer of the heart shape. 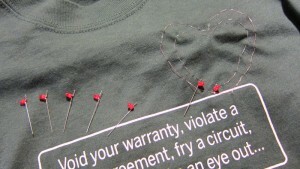 On the inner side of the fabric, use an electric tape to fix the wire, and also to avoid shorting it with other wires. 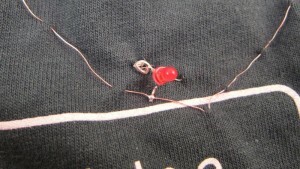 One advantage of using the wire is that you can solder electronic components directly onto it. 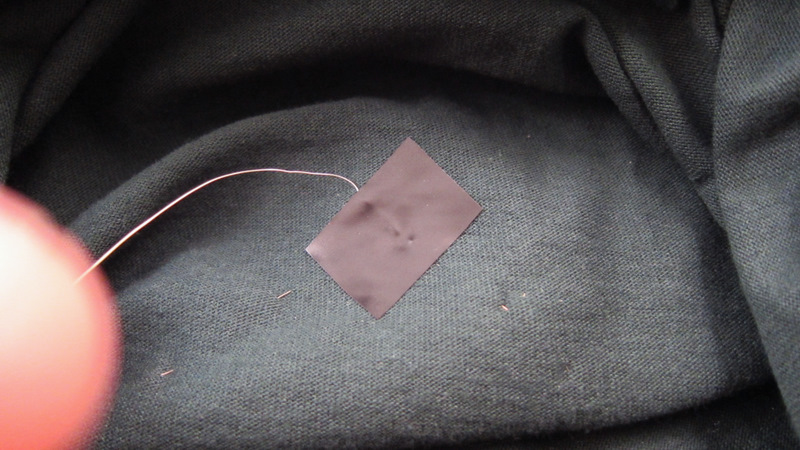 But if you want to avoid soldering, you can still use the wire to sew the component leads to the fabric (in the same way as conductive thread). 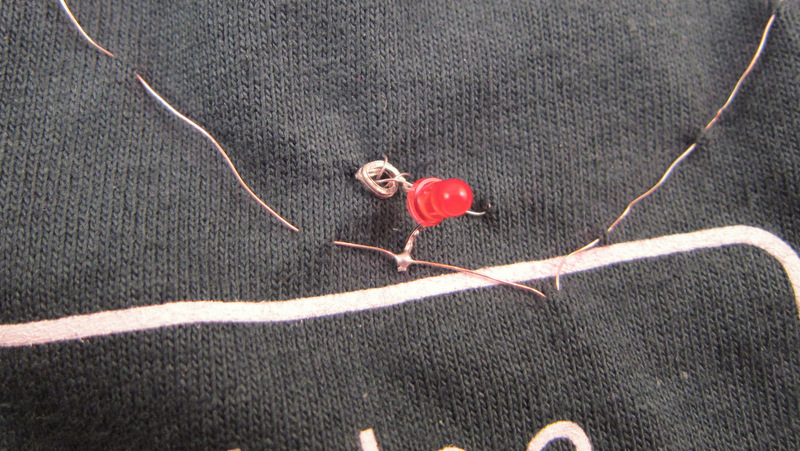 In this image, the upper lead of the LED is sewed using the wire (without soldering), and the lower lead is soldered. Now I will solder LEDs onto the two wires. All LEDs are connected in parallel. 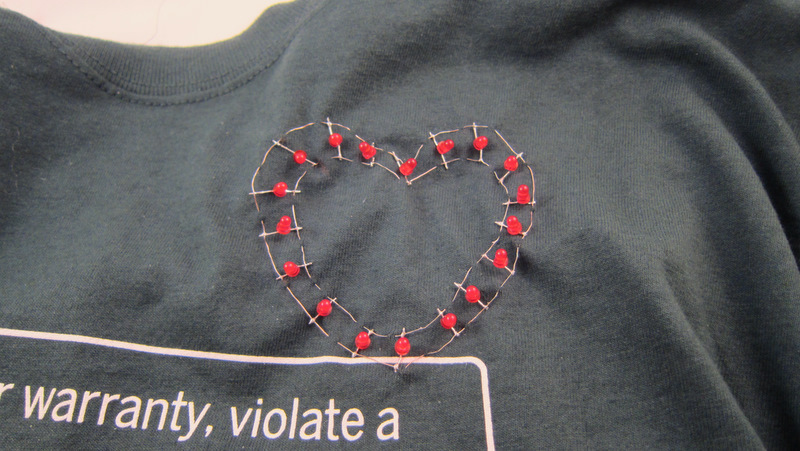 The outer wire corresponds to positive lead, and inner wire negative. A good way to keep everything organized is to first prepare all LEDs: bend their leads, and cut the negative leads short. This way, you won’t forget which lead is positive! 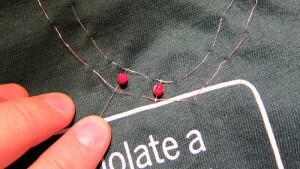 Try to keep an even spacing between LEDs, and fix them with a small amount of solder. After this is completed, connect the two wires to a battery to test if all LEDs are working. Now use a wire cutter to cut all excessive leads. I actually like the spikes in the previous image. Looks more artistic :). 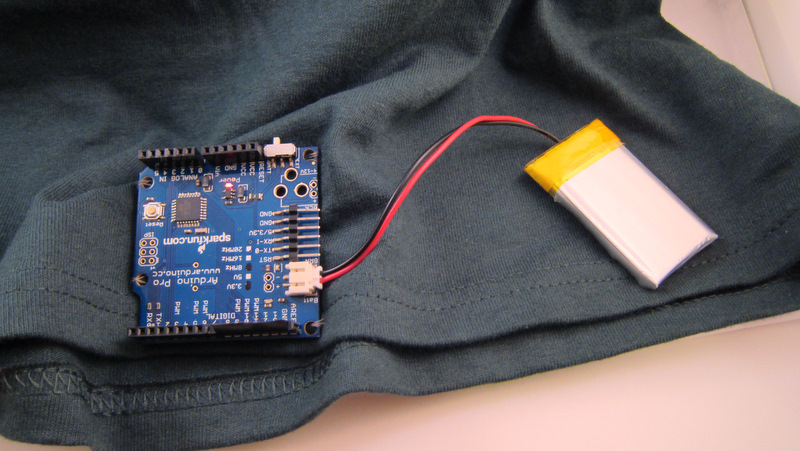 To provide programmable LED patterns, I use an Arduino Pro from Sparkfun. 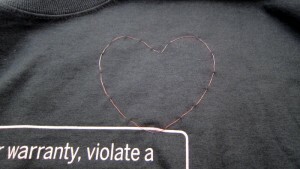 I sewed it onto the bottom of the shirt using normal threads. 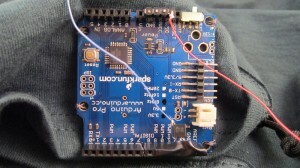 I use Arduino Pin 11 to provide PWM control. 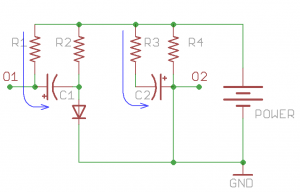 Since there are 18 LEDs connected in parallel, driving them together requires a current that exceeds the limit of a single IO pin. So I use a BS170 MOSFET to switch the LEDs directly from power supply. 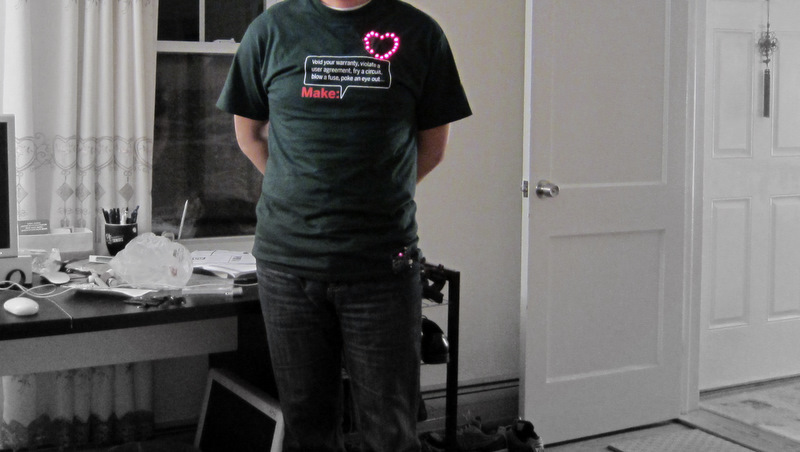 Here I am, wearing the Make T-Shirt customized with an LED heart! The LEDs are programmed with three modes: constant on, flashing, and fading. See the video above for demo. Enjoy! 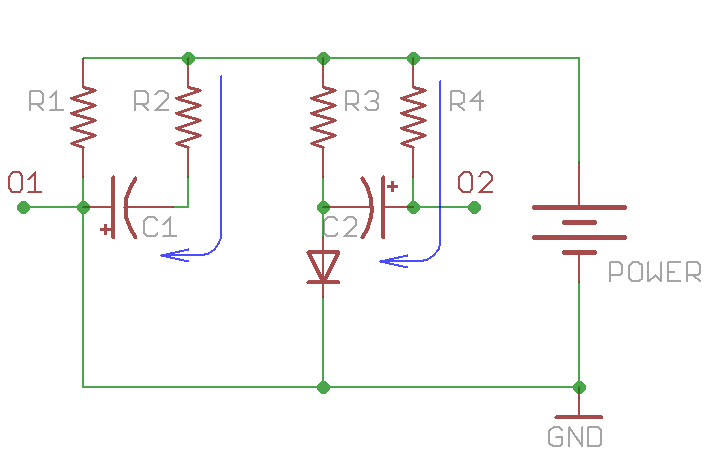 It consists of only two NPN transistors (T1 and T2), two capacitors (C1 and C2), and four resistors (R1-R4), organized in a symmetric fashion. 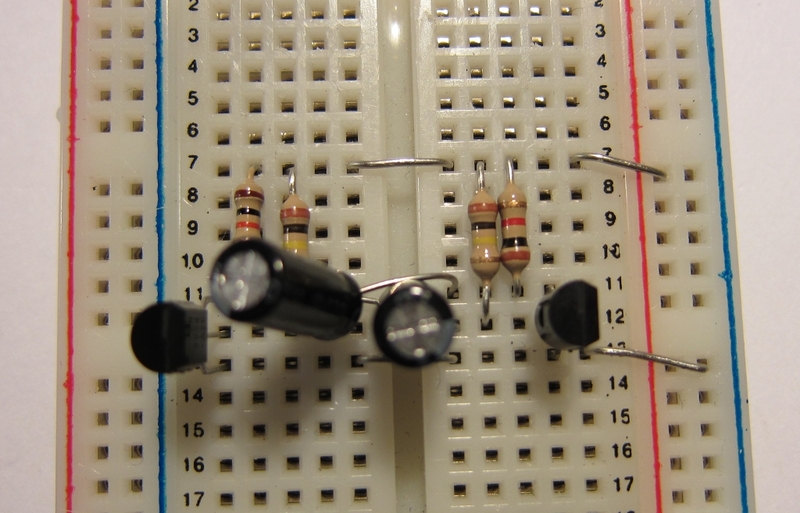 The collectors of T1 and T2 are outputs, which provide complement square wave signals. 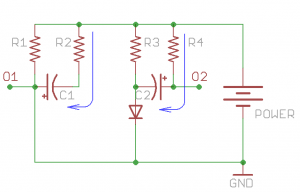 The values of the capacitors and resistors can vary depend on the desired frequency, and their values do not have to be symmetric. Update: as some readers pointed out, for square wave output, the resistor values should satisfy: R2 / R1 < h_fe, where h_fe is the transistor's current gain (same for R3 and R4). As h_fe is usually around 80 to 250 for 2N3904, the specific values above (R1=1K, R2=100K) are close to the margin. To improve this, consider increasing R1 or decreasing R2. 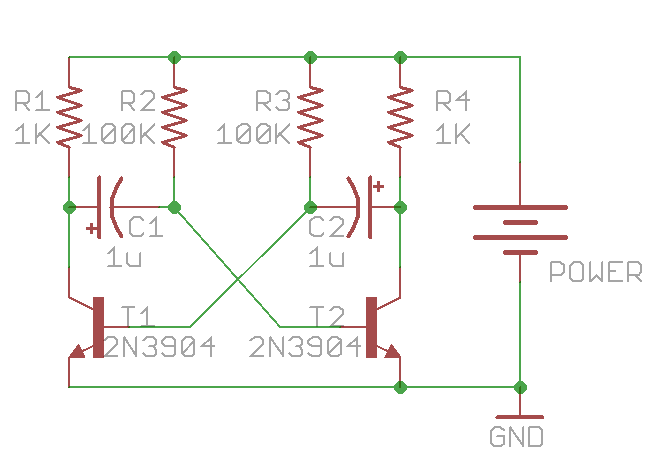 Alternatively, you can replace 2N3904 with BC547, or even a Darlington transistor (e.g. MPSA14), which have higher h_fe values. During this period, T2’s collector (output O2) remains low, and C2 begins to charge through R3. Thus the voltage on C2’s left lead will rise, and the rising time depends on R3 x C2. 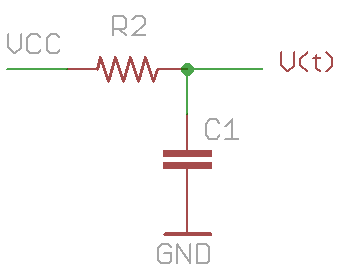 At the same time, C1 also charges, through R1, which is typically a small resistor (e.g. 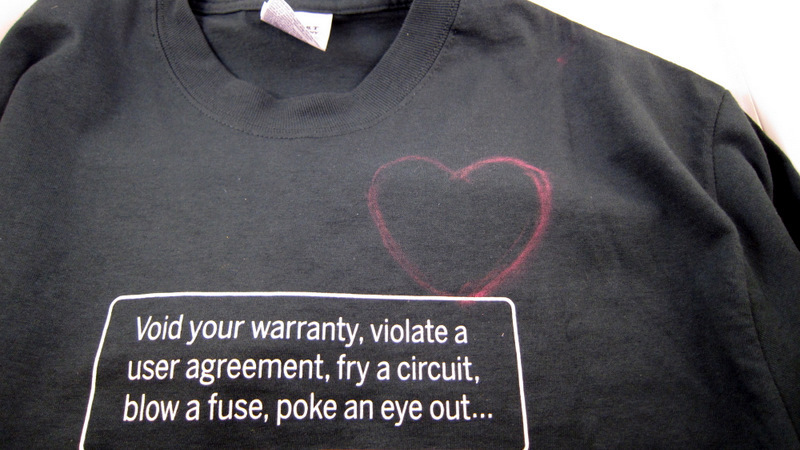 100-1000 ohm). So C1’s left lead (output O1) will quickly rise up to Vcc and remains high. 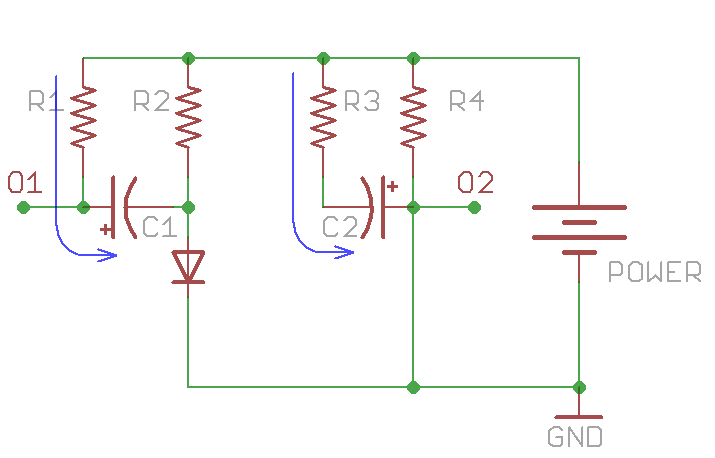 During this period, output O1 will remain low, and output O2 will quickly rise to Vcc (due to the charging of C2 through a small resistor R4). At the same time, C1 charges through R2 and the voltage on its right lead will rise over time determined by R2 x C1. Now you can predict what’s going to happen: as C1 continues to charge, the next critical moment happens when C1’s right lead rises above 0.7V. At that point, T2 will conduct again while T1 shuts off. The same cycle will repeat. There you go, oscillators! Now we have to do some calculus to find out the frequency of the oscillator. Let me focus on output O2. 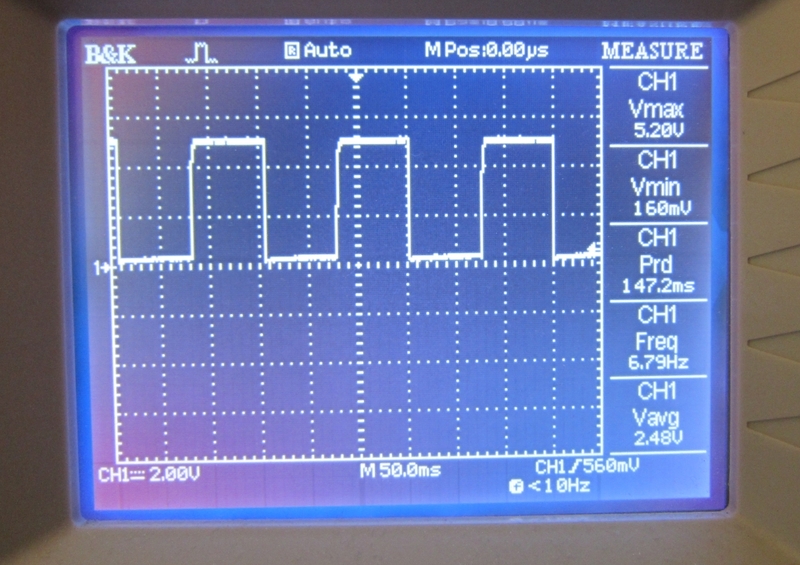 As it alternates between low and high, it approximates a square wave. How to find out the frequency? 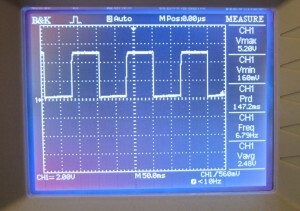 Note at the end of stage 1, C1 has a voltage of (Vcc – Vb) across it (where Vb = 0.7V). 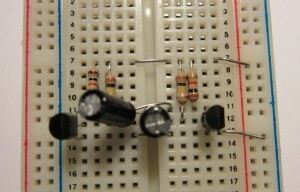 Again, the voltage establishes very quickly because R1 is small. The moment the circuit transitions from stage 1 to stage 2, C1’s right lead has an initial negative voltage: -(Vcc – Vb), and the circuit remains in this stage until that lead rises up to +Vb. So let’s calculate how long this will take. There are ready-made equations to compute this, but here let me derive it from basic differential equations. With the given values in the first schematic (C1=C2=1uF, R2=R3=100K), the frequency is roughly 6.5Hz. 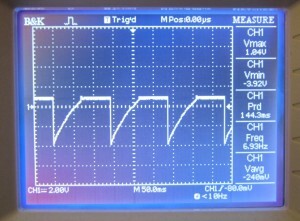 These symmetric values can produce a square wave of 50% duty cycle. But they do not have to be symmetric. By using different R2 and R3 (or different C1 and C2), you can easily create waves with any desired duty cycle. 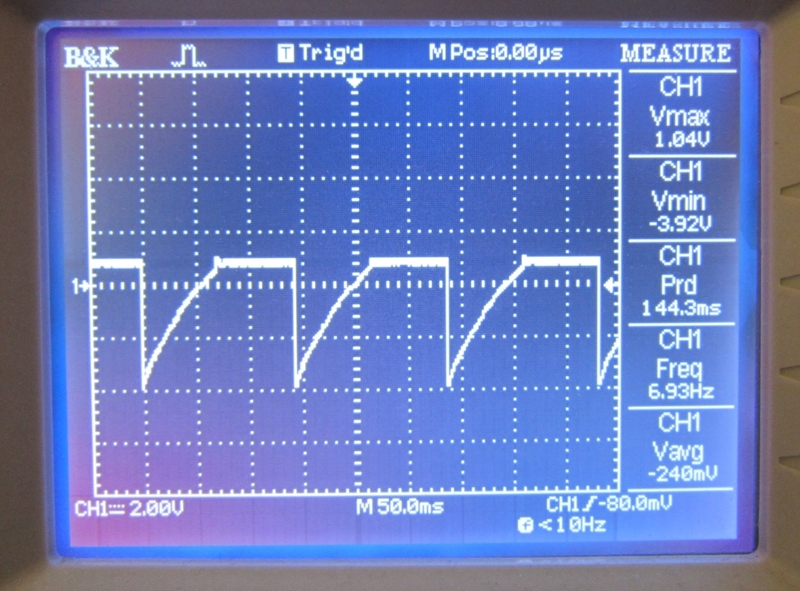 Connecting an oscilloscope to output O2, the result shows a decent square wave with 50% duty cycle at about 6.7Hz. Looks quite nice. I also checked the signal on T2’s base pin. The result is on the left. As you can see, the beginning of stage 2 is signaled by the jump to a large negative value. During this stage, C1 charges through R2, so T2’s base voltage rises continuously. As soon as it crosses Vb, T2 conducts, and its base remains at Vb until the start of the next cycle. Finally, if you want, you can make a printed circuit board, so you can carry it around, or use it to decorate a toy with flashing LEDs. Enjoy! Since Vb+Vled is quite significant compared to Vcc, we cannot make the same approximation as above anymore. For example, with the given values in the first schematic (C1=C2=1uF, R2=R3=100K), and assume Vcc=+5V, the frequency is now roughly 10Hz (compared to 6.5Hz when LEDs are not connected). So this explained why the LED blinking speed seems faster than calculated.